Carl Lawson is a linear athlete that has shown the ability to win with hand use and head fakes. Lawson was one of the top recruits in the nation coming out in 2013 and ranked second behind only Robert Nkemdiche by ESPN. As a high school senior, he was able to compile 27 sacks and became the headliner for Gus Malzahn’s first recruiting class at Auburn. 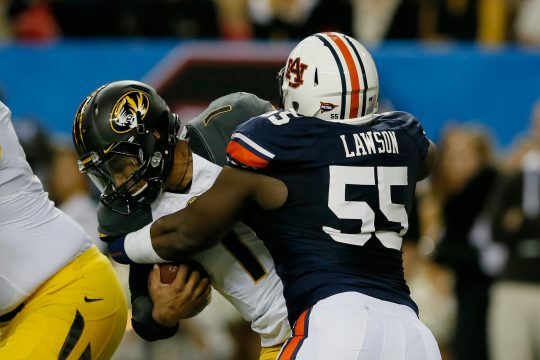 As a true freshman, Lawson was able to play in 11 games and compiled 4 sacks in a limited role before Auburn lost in the National Championship to Florida State. Unfortunately for Lawson, his 2013 season was cut short due to a torn ACL, which also kept him out all of the 2014 season because of complications. Following his recovery, Lawson began the 2015 season ready to take the next step before cracking his hip in the season opener. The hip injury cost him half of 2015. He returned to finish with just 17 tackles and one sack. In 2016, Lawson was able to have a career year finishing third in the SEC with 9.5 sacks and 13 tackles for loss. Lawson was never able to reach the potential many thought he had, and his injury history may be concerning for decision makers at the next level. But plenty of mock drafts, like the great one at SportsBettingDime.com, are stocked with highlights that indicate he’d make a good choice for a team in need of a rusher. Lawson has a good first step and uses his hands effectively to defeat the hands of blocker. He is able to time them well and this is the way that he makes most of his plays. He also seems to have an effective head fake that he will use for his edge rush. Lawson is able to hold his ground adequately, defeats cut blocks well and is able to stuff pulling blockers very strong. Most of his snaps this past season came standing up but he seemed to be more effective with his hand on the ground. Doing that forces him to play with proper pad level, better base, and helps him with his hand placement/extension. Lawson is a linear athlete and plays with a narrow base at times. He also struggles with his pad level. All of those things contribute to his lack of lateral quickness and make him seem like a stiff player. He isn’t much of an impact in the running game but he is able to just hold his ground. He unfortunately doesn’t normally find a way to get off the block and make a play. Lawson seems like one of those players that will win at the line a scrimmage, but not really be able to make a lot of plays afterward. He also doesn’t have very much experience playing in space. He’s able to make plays in front of him when put in that situation but the rest seems to be uncomfortable for him.